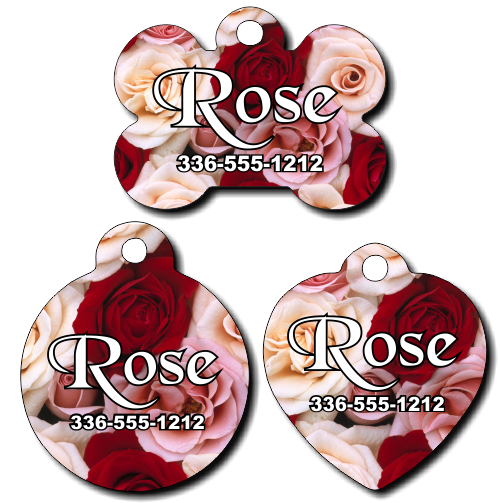 Personalized Roses Background Pet Tag for Dogs and Cats. This identification tag is more than just a pretty charm for your pet's collar. It can be personalized so that if you and your furry friend are separated you can easily be contacted. Easy to order. Just enter the name of your pet, then enter your phone number and we will make your custom pet name tag to order. Production Time: This is a custom item which requires time to design and to produce. The normal production time for this item is 5 to 7 business days. Shipping can take another 1 to 7 business days depending on where you are located and the shipping method you select at checkout. Rush production is available upon request. If you need this item produced quicker you may choose a Rush Service. Explanation of Rush Services: Choosing a Rush Service will get your custom tag designed and produced quicker than our normal production times. Please understand that choosing a Rush Production Time in no way effects the shipper or shipping service that will be used. You may also select an expedited shipping service at checkout if you need the shipper to deliver the custom item faster. Bale: Circular metal ring for attaching to pets collar. Please note that if the "Telephone Number" space is left blank, we will not print a telephone number in that space. It will be left blank.